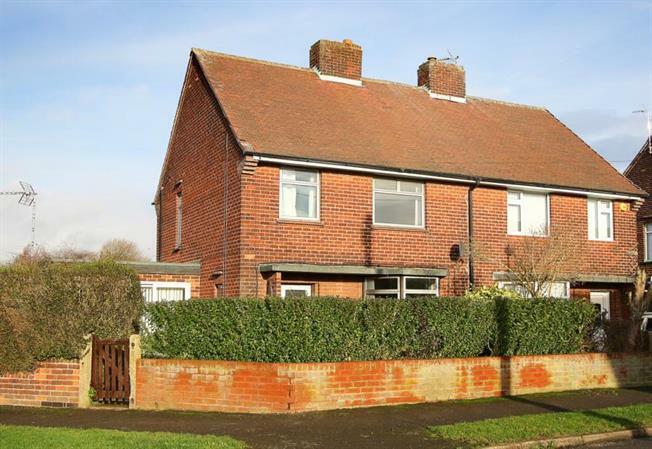 3 Bedroom Semi Detached House For Sale in Chesterfield for Guide Price £120,000. We are excited to bring to the market this extended three bedroom semi detached property. Situated on a corner plot with a detached single garage, driveway and large garden in the popular area of Glapwell. The property comprises of: entrance hall leading to the living room with bay window and gas effect living flame fire with marble surround and wooden hearth. Also from the hall access is provided into the kitchen with a range of wall and base units and fitted oven/hob with extractor above. The dining room has a traditional wood burning stove on a tiled hearth and an imposing wooden mantle, a built-in storage cupboard and views over the rear garden. The ground floor also benefits from the useful study and downstairs w.c.
To the first floor is the three bedrooms and the family bathroom with low flush w.c, wash hand basin and walk in shower. Only upon internal inspection can the potential of this property be fully appreciated. A small village located on the east side of Chesterfield, Glapwell is a sought after village ideally situated for commuting to nearby towns of Chesterfield, Mansfield and Junction 29 of the M1 is only 2 miles away. The village has a local shop\post office and two public houses - The Young Vanish and The Plug and Feathers. Local primaries and nearby secondary schools are also located in close proximities. The magnificent Hardwick Hall is also located nearby which dates back to the Elizabethan period and features stunning architecture and walks around the park and historic lakes.